Recently one of the most beautiful couples in Hollywood, Scarlett Johansson and Ryan Reynolds, officially divorced. As celebrities weddings is the breaking news, the same public attention attract their split ups. The actor claimed it was “irreconcilable differences” which caused their separation. Scarlet Johansson and Ryan Reynolds were not the only so-called beautiful couple ended up with divorce. Seems, celebrities used to indulge public appetite for hot news. However some beautiful couples can be called strong enough. Monica Bellucci, one of the sexiest women in the world, and French actor Vincent Cassel are together for 12 years. When they first met, they didn’t like each other however through time became more patient towards each other and eventually start dating. 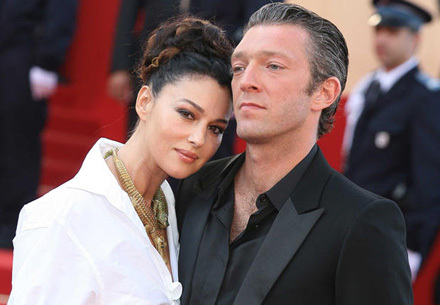 In 1999, Vincent Cassel and Monica Bellucci got married. Sometimes they live separately – he is his apartment in Paris, she – in her London shelter. They believe that this helps their relationship be strong. Another one couple consists of French actress and singer Vanessa Paradis and American superstar Johnny Depp. Technically she’s just his girlfriend. But if remembering that they are dating for 13 years and have two children, it doesn’t actually matter. Each summer people say we’re supposed to be getting married, but we don’t talk about it that much. He’s got me, and he knows he’s got me. Recipe #3 from Angelina Jolie and Brad Pitt: 6 children and collaborative work for people living in difficult conditions. Both of them experienced enough – Brad already had been engaged to Gwyneth Paltrow, married to Jennifer Aniston; Angelina had two marriages. Maybe that’s why they do their best to make their relationship last. Vanessa Hudgens: Zac is a cheater! Honestly, I have seen better looking couples walking around downtown or at parties, or at restaurants plenty of times. they are just not THAT hot.